This piece was written for The Guardian in August 2012, after A-level results showed the number of UK students taking German had declined to below 5,000 for the first time. There were also significant drops in French and other modern languages. 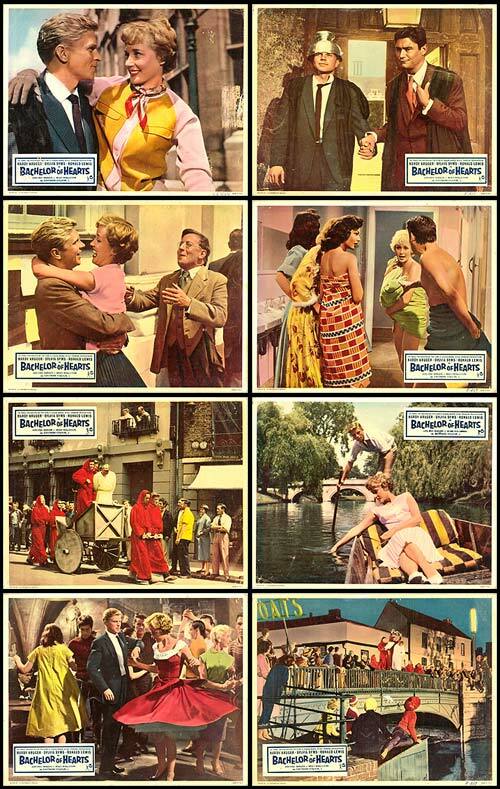 In 1958, with the memory of the War still strong, the British film industry made a romantic comedy to rehabilitate the image of young Germans. The film starred Hardy Kruger as the eponymous Bachelor of Hearts, coming to study at Cambridge. His love interest, taking a German degree, was Sylvia Syms; the nation’s favourite girl next door, with an A-grade German A-level. If war-wearied Brits saw the value of learning it 60 years ago, how have we come to the current state of affairs? Fewer than 5,000 UK students took the A-level this year. When I got my own A at A-level German in 1986, West Berlin was regarded as a dopey hangout for draft-dodging hippies. Unless you were planning a Nick Clegg-style Eurocrat career, you didn’t need it. In my school’s A-level prospectus, it said taking A-level French or German broke you out of your national barriers and attained a level of understanding that made you a citizen of a wider world. Now German is the language of the nation which supports the British economy and keeps the Eurozone alive, bailing out places we like to go on holiday like struggling Spain and Greece. British politicians on all sides praise its model manufacturing base, labour relations and education system (technical schools from 14, not just comprehensives and grammar schools). So why this week have I found myself discussing the language with a klatsch of other German A-levellers, as if we were the last few living speakers of a doomed tongue like Cornish? Let the German A-level fight back start here. Given a chance many children find to their surprise, as I did in compulsory Year 9 lessons, that they are good at it. It turns out this is especially true for children who have English as an additional language at home. That’s according to Katharine Crouch, the head of Sutton High School for Girls in South London, where all students must do half a year of German in year 7 and its German A-level results are consistently strong. “It’s a logical language,” she says. “The girls learn the framework. The phonetic aspect of German and also the pronunciation is much easier for some to grasp.” She says some students with dyslexia have found German easier than French. Like many other students of modern languages, German got me my first snog (an Austrian called Hubert). It got me my first extended experience of living in another culture that wasn’t British or Asian, thanks to an A-level summer school in a small town near Leverkusen. The same summer that my fellow 17 year old Boris Becker won his first Wimbledon, I was welcomed by a kindly German host family and made my first kartoffel kuchen – potato cakes – at their Lutheran church summer fair and (valuable lesson this for a future career in journalism) found myself the front page splash of the local German newspaper, which deliberately misquoted me so it sounded like I was slagging off the German school system. Back in London, after a degree in English, I starting my career at the BBC while some of my German friends, got their first break at the (now long closed down) German language department at the World Service. The professional links and possibilities meant the new united Germany kept pulling me back. In 1998 I answered an ad in the Guardian for a news presenting job in Berlin and spent a fascinating year working for Deutsche Welle TV in a newsroom with the odd ex-MI6 spy who’d stayed on and would share stories of life before the Wall came down. I delighted in the unmatched ability of Berliners to turn derelict factories into the coolest secret cinemas and clubs. The complex but logical structure of the language was a useful insight into (sometimes infuriating) German thinking. If you understand how carefully they order their ideas into words it explains so much: Time, Manner, then Place, and the verb as second idea or sometimes banished to the end of the sentence. But most of all I learned to understand an often mistrusted people and culture, and on an individual scale play a part in breaking down the mistrust and misunderstanding that came the other way, especially about Empire and race. 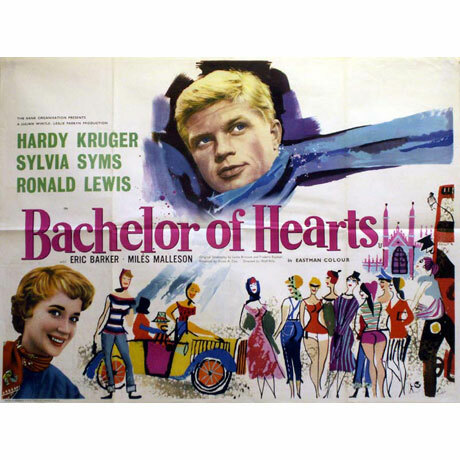 This entry was posted in Comedy, Culture, Education, Film, Germany, Uncategorized and tagged 50s, A-levels, Bachelor of Hearts, Cambridge, cinema, culture, film, Hardy Kruger, Schools, Sylvia Syms, universities. Bookmark the permalink.